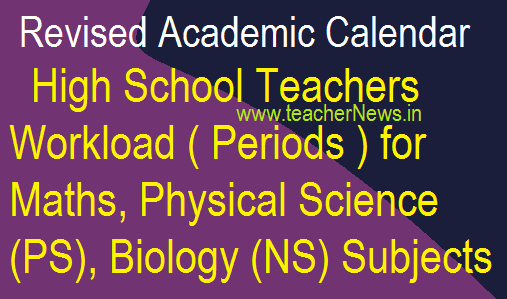 High School Teachers Workload for Maths, PS, Biology Subjects - Revised Academic Calendar 2018-19 : AP Revised Academic Calendar 2018-19 in All Primary, UP, and High Schools, Mathematics Revised Periods class wise allotment list, Physical Science (PS) Subject New workload periods and Biology Subject Teachers Revised Periods as per Proc. Re. No. 443/132/C&T/SCER 172015 Dated: 13-07-2018 Sub:- SCERT, AP, Amaravathi - Implementation of Academic Calendar in all Primary, UP, High School for the year 2018 -19 Orders issued - Reg, District Educational officers in the state are here by informed that the following work load may be followed among all subject teachers in High Schools. The District Educational officers are requested to give proper information to all the Head Masters of High Schools to prepare time tables and period allotments to the subject teachers for effective classroom transactions. School timings. IMPLEMENTATION MATHS, PHYSICAL SCIENCE, BIOLOGY SUBJECTS WORKLOAD OF ACADEMIC CALENDAR IN ALL PRIMARY, UP, HIGH SCHOOL FOR THE YEAR 2018-19 | RC.NO.443. AP Implementation of Academic Calendar in all Primary/UP & High School for the year 2018 -2019. Equal work load to teachers in all schools-Implementation of Acedamic Calender in all PS, UPS and High Schools for the year 2018-19,SCERTAP Rc.443 Equal work load to teachers in all schools. Total : 28 periods a week. Note : No need deal 6th Maths. Total : 27 periods / week. Note : No need deal 6th - 9th EVS.